I think that Memories of the Sun would be a fitting name for a Pittsburgh blog. When I was younger, I loved dark, cloudy weather. I’ve never been a fan of the steel gray overcast that doesn’t change, but it didn’t bother me much. After experiencing it nearly nonstop for the past few months, it gets to you a bit. I didn’t fully realize that until I was standing outside today, in the park, with the sun out, and the sky deep blue beside swiftly moving cumulus clouds. I missed the sun. My favorite Pittsburgh weather comes at the beginning of autumn, when the temperature begins to drop and the leaves are changing. It doesn’t seem to rain quite as much then and it can be quite beautiful. I’ll be travelling south this week, to Oak Island, NC for my sister’s wedding. The North Kakalakee beach in early summer (which begins in April in the South) should be nice and refreshing. And just as summer begins there early, spring gets started late here. It has been less than 60 degrees out for most of the past week. Suffice it to say, probably no blogging for the next week. 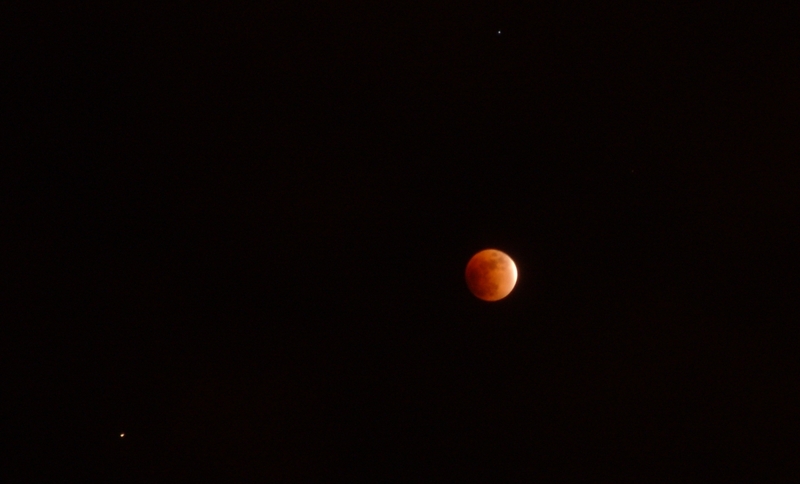 Last night was the last total lunar eclipse for two years and it was quite good. Pittsburgh weather cleared long enough for me to snap a couple shots of the unobstructed moon with Regulus (the brightest star in the constellation Leo) bright above it and Saturn even brighter to the bottom left. There was still a light haze that I think made it difficult for me to get the focus right. I was able to capture the rich, red color while the moon was still exposing a sliver of sun-drenched rock. Then the clouds came in earnest and I was getting tired, so I went to bed, missing the full umbra. But at least I got to see some of it this time. Last time there was a lunar eclipse, I was completely out of luck. There was a big thunderstorm this morning that totally drenched my feet. However, in the darkness I did see something that I thought was quite cool. 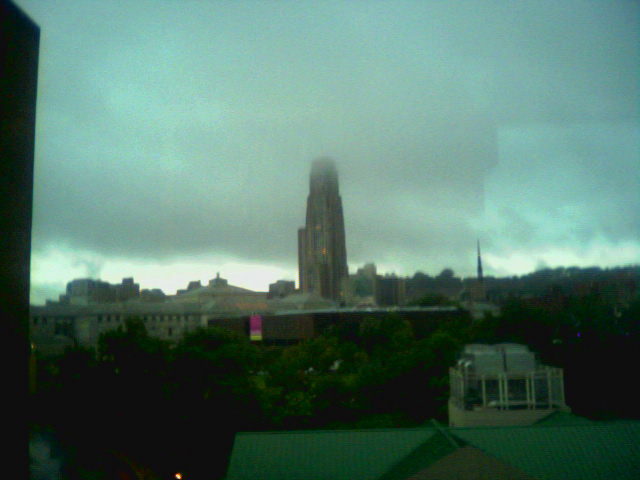 The Cathedral of Learning at Pitt with its crown shrouded in clouds. Unfortunately my piece of crap cell phone doesn’t do it justice.